The size, color, method of operation and installing to a control panel of the AD-4401A remains the same as the AD-4401. be used without changing any connectors. Functions have been added but the default settings remain identical to the AD-4401. The High-Performance Digital Filter provides high accuracy/high speed weighing in environments with vibration problems. mechanical measures. 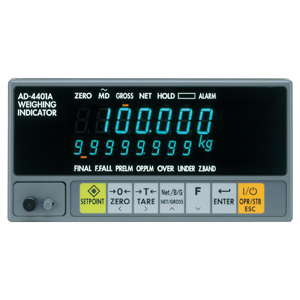 What's more, conducting weighing while applying vibrations, once an extremely difficult task, is now possible. CAD File (DXF) Some characters may be garbled as the original CAD data is in Japanese.